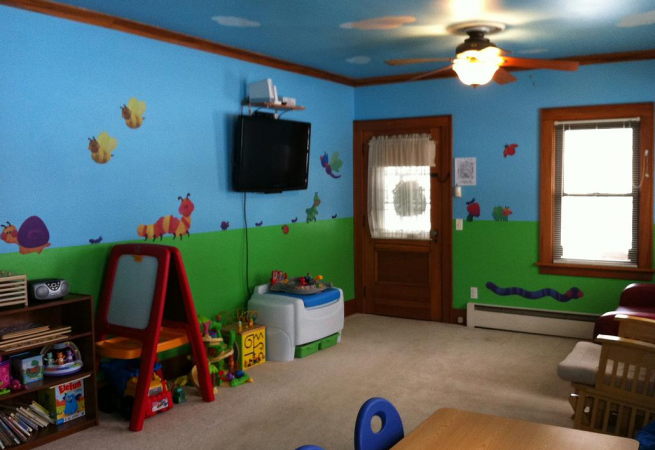 The Caterpillar Clubhouse is a licensed family child care provider in Rochester, NY. The Caterpillar Clubhouse cares for children as young as 6 weeks through 12 years old. 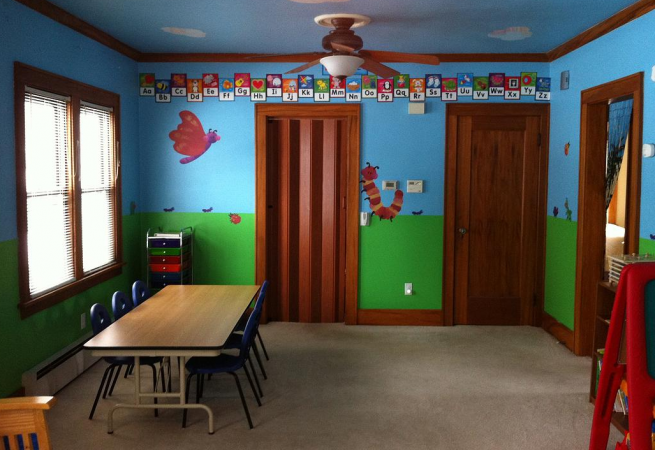 This is a home-based child care that offers a small setting. To learn more about this child care provider, please send them an email. ​Music time is one part of our day where active bodies are encouraged! We have plenty of fun children's songs to sing along with, dance to and play instruments with. Some of our songs are the Hokey Pokey, The Chicken dance, Five little monkeys jumping on the bed, and many more! I also provide calm soothing instrumental music at nap/quiet time to help calm tired but crazy little bodies. Creativity is always welcome during craft time! We make tons of fun things to bring home and share with the family! It might be a foam butterfly or star magnet to decorate, a shamrock for St. Patrick's Day, or a styro-foam snowman for a coffee table decoration for winter. I have plenty of supplies like crayons, markers, glue, scissors and stickers if the kids just want to explore their own creative ideas as well. This is the part of our day where social skills are put to use, and imagination runs wild. I have many age appropriate toys for everyone to encourage growth and development of small and large motor skills. We work on sharing and taking turns. I share all my toys with all the kids here at The Caterpillar Clubhouse! Toys are cleaned and sanitized daily. I provide mats and pack and plays that are cleaned and sanitized after each use. Please bring any special blanket or nap time toy they need. Personal sleeping bags are also encouraged. I will keep them here and wash them weekly. I have a napping arrangement agreement that I'll go over with you, and infants have the availability to nap on and off throughout the day with a baby monitor and 15 minute checks. Reading opens so many doors for young minds, and I definitely encourage reading here! We have story time with some of our fun books, but the books are available throughout the day for reading. Story time is followed by a short discussion of the book. There are books for every age group, whether they are just starting out or are already a super reader! Sometimes a craft we make earlier in the day might tie into the story we read later. ​We go outside everyday-weather permitting. I have a nice large, fenced backyard great for everyone to use some energy and get some great exercise! I have a fun roller-coaster great for kids up to 11 years old (with a helmet). A fun clubhouse to play in, and a giant caterpillar to climb on and through. I also have smaller toys like soft frisbees, kick balls, ride-on toys and more! We'll also be running through the sprinkler on those hot days, and we like to go on walks whenever possible. Please bring sunscreen for your children with their name on it, and remember....it's easier to run and play in sneakers and comfortable clothes! I had a tough time trying to find a good sitter willing to take on a child with special needs. After months of being turned down by sitters, i was able to find Natousha who took on Alex without hesitation. She has been amazing with him. Every therapist that sees Alex at her place says that i am so lucky i found her. My son has been in Natousha's care for almost 2 years. She has always put Alexander's needs as a top priority as well as the needs of all her kids. She loves the kids in her care as much as her own children. She is a "straight shooter". If she sees an issue either behaviorally or developmentally, she will let the parents know. She will also let the parents know how she is helping the child in her care and will give the parents ideas of what to do at home. My son has down syndrome but she has always treated him as any other child, which I love. I don't know what I would do with out her!